I got a kidney infection shortly after starting Enbrel. It was Good Friday 2009. My kidney hurt and fever spiked to 104.5, after 3 days of UTI. Before then, I’d only had a minor UTI with pregnancy. This is when my GP got the nickname “Good GP” because of responding quickly with an antibiotic. In two days, the infection symptoms were gone, but something was wrong with my Achilles tendons: they were inflamed and too painful to walk on. Living with Rheumatoid, I’m used to walking through lots of pain, but I knew something was wrong. When the sensation didn’t subside, I called a few pharmacists, describing my situation. There was a consensus to stop the ciprofloxacin, and I did. The tendons recovered. Monday, I called the rheumatologist (Dr. Dolittle) who had prescribed the Enbrel. I’d seen him only once, after 3 years of Dr. KBC. I called to find out whether to take the Enbrel and whether he thought I needed another antibiotic. He told me: “That’s not a real side effect.” I could tell he didn’t believe me, and I shouldn’t have, but I went back there one more time. A few patients have sent me emails about the dangers of ciprofloxacin and other medicines in the fluoroquinolone class, asking me to discuss the issue. One patient I know believes Levaquin, a fluoroquinolone, triggered her Rheumatoid Arthritis diagnosis. I tend to believe patient stories, since my kids and I have been disbelieved so many times and turned out to be right (examples in an article I wrote for e-patients.net a few years ago). But I’m also a healthy skeptic and lover of evidence. First, let’s look at some medical literature, then an astonishing conversation between a doctor and dozens of patients. How might fluoroquinolones (FQ) damage tendons? What happens if FQ damages tendons? The FDA.gov page places less emphasis on musculoskeletal risk, but does say to tell your doctor if “Have rheumatoid arthritis (RA) or other history of joint problems,” or take anti-inflammatories, or take steroids, or take methotrexate, or take omeprazole or a list of other drugs. 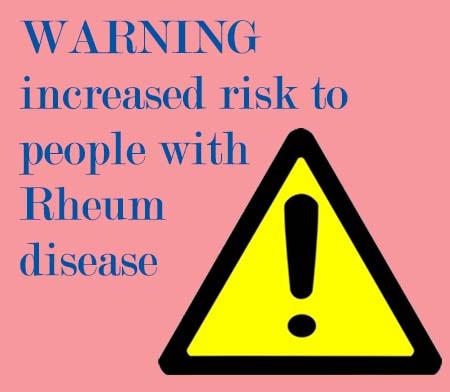 There are further warnings, but these commonly pertain to people with Rheumatoid disease. Side effects have often been a point of doubt, so that patients are not always warned in case they might imagine or exaggerate. Obviously, I think people who become patients can be trusted with as much information as they feel comfortable with. On this blog, I’ve always been cautious in mentioning adverse events so that I don’t frighten others (while Enbrel gave me hives and Orencia severe bronchitis, many have taken them safely). Reporting any side effects to your doctor is important, and doctors should take it seriously. The case of Cipro / FQ’s shows sometimes doctors are unaware of serious possible side effects. I’m glad he changed his mind, but doctors and patients both need to be informed. Usually, the patient will know best his/her complicated health profile with a chronic disease. Since my Cipro – Achilles tendon incident a few years ago, Dr. GP and I make medication decisions together. In my electronic chart, doc has a list of which meds I shouldn’t take; we look at that and doc asks, “Can you take _____ for _____?” out loud and looks it up online to check for warnings. A Medline search can be done in seconds. Apparently there are books, support groups, and citizen protests opposing this class of antibiotics. The PBS NewsHour even did a segment about quinolone antibiotics. There may be some hype in some of the campaigns, but it is clear that after a surprising number of adverse events, the FDA increased the warnings, and people with Rheumatoid Disease are identified as having greater risk. List of medications in the same class as Cipro: quinolone or fluoroquinolone antibiotics such as gatifloxacin (Tequin) (not available in the U.S.), gemifloxacin (Factive), levofloxacin (Levaquin), lomefloxacin (Maxaquin) (not available in the U.S.), moxifloxacin (Avelox), nalidixic acid (NegGram), norfloxacin (Noroxin), ofloxacin (Floxin), and sparfloxacin (Zagam) (not available in the U.S.). Does Rheumatoid Arthritis Affect Tendons? I have had the same experience. After Cipro 2 1/2 yrs ago my life has not been the same. 6 mos later I was diagnosed sero-neg RA. This is so amazing to me. After 6 drs later no Dr. has agreed that there’s a connection. I think the problem with fluoroquinolone toxicity issue is that these drugs are so widely prescribed, you will never get a physician to admit that they might just possibly be dangerous. Which is a shame. I’m not looking to sue anyone. I’m just trying to get the help I need to regain whatever of my health is still salvageable. I’ve had this happen both times I took Levaquin for unresponsive bouts of pneumonia. Both times it happened, it was a couple of months later so I didn’t relate the two things. The first time it happened was in 2008. I had not been diagnosed with RA. It was nearly a year later that I just happened to come across an article about it when I made the connection. Even this most recent time, which was earlier this year, I didn’t make the connection immediately because of the delay. Fortunately, it wasn’t an extremely bad tear either time, but it was sudden, with no relation to activity. I am an NNP and these are well known risks of taking Levaquin especially, to anyone over 60. Levaquin does not give me tendonitis, but it produces muscle weakness to the point of feeling it is an effort to breathe. This is also a side effect I experienced many years ago with Macrodantin. Currently the only antibiotics I can safely take are Azithromax and Clindamycin. Always research any drug you are given and ask questions. And if you are not comfortable with the risk then ask for an alternate medication. I am allergic to many antibiotics but Cipro is one I can take.I have had a lot of tendonitis with my RA but have been able to take Cipro while on Prednisone and Humira or Orencia without a problem, but was warned by my family physician and pharmacist about this possible side effect. I will definitely be cautious in the future, but it appears not everyone has this side effect and with multiple allergies sometimes there may not be another alternative, but everyone should be aware of this problem. I agree Brenda. Some can take it safely, but everyone should be aware. They don’t have a test to see if it’s safe for a particular patient & some have permanent damage after taking it. All of these decisions can be complicated, like you said, by various allergies etc, so it’s all about informed choice. In 2004 (two years before I started with Rheumatoid Arthritis) I had a simple eye infection in my left eye that had lasted several days. The gp I saw (who was filling in for my regular doctor) prescribed Ciprofloxacin eye drops..a very potent, very expensive drug (definitely over prescribed, as all I needed was a simple eye drop). Anyhow, I was told to use 2 drops in the infected eye every 2 hours for 2 days, then every 4 hours for the next 5 days. At the end of the first day, my neck was stiff on the left side. I thought nothing of it. By the end of the second day, there was stiffness radiating from my neck down to my left shoulder. I figured I must have strained it somehow. By the middle of the third day, the stiffness was on the left side of my neck, my left shoulder, and radiating down over the scapula. At that point I finally put 2 and 2 together, and went online to do some research on this drug. I found some reports of tendon inflammation issues with Cipro, and that answered my question immediately. I stopped taking it (it was not doing a thing to cure the eye infection anyhow)and reported the adverse reaction to the FDA (they have an online site where you can post adverse reactions to drugs). That was the ONLY drug I was taking at the time, so there was no issue with other drugs causing this reaction. I have told everyone to STAY AWAY FROM CIPRO. Doctors are prescribing it the way they used to prescribe Penicillin back in the day. One friend took Cipro as a preventative when she went to China on vacation! I have made sure that CIPRO is on my SEVERE ALLERGIES list with all my doctors! One quick other note regarding having RA and antibiotics. A year ago I had a large kidney stone removed, and the urologist prescribed Bactrim DS 800-160 after the surgery to prevent infection. I had used Bactrim a decade or so earlier for an infection with no problems. I currently take Minocin to keep my RA in remission, but only take 3 100mg tablets per week. In order to avoid any problems with 2 drugs at a time, I had stopped taking the Minocin several days before the surgery, so had not taken any in 6 days when I was given the Bactrim prescription. I was told to take one tablet every 12 hours. That nite, after having taken 2 tablets that day, I was experiencing a severe headache. It lasted thru the nite, and after the morning dose, got even worse. I had to go lie down mid-day. I did not take another pill that nite, and my head felt like there were electrical sparks going crazy in my brain. That lasted all night long, and I got really sick, nauseous, feeling rotten. I took no more Bactrim, waited for two days for the sickness to lessen, then went back to my Minocin. However, all my joints had by then started to swell up and become painful. EVENTUALLY I was able to get back to a status of remission, but it was a LONG HAUL. My Rheumatologist told me that people with RA should NEVER TAKE DRUGS with SULFA. And that one has lots of Sulfa in it! So just a warning…stay away from Antibiotics with Sulfa drugs! I just read about the connection between RA & Cipro. I finally feel like my connection with taking Cipro, does make since. I took Cipro 2 1/2 yrs ago. After a week on the meds for a UTI. I had the worse pains, started in a few,& quickly moved all through both hands, feet, & ankles. 3 months later I was told I had carpal tunnel,followed by surgery. (which didnt explain why I had feet pain). Had complications after surgery, tendons where affected & I had 6 months of PT.so I could bend my hand.I was seen by 6 drs.in 6 mos. Then I was told by my Rhuemy you have RA. I tested negative.This is amazing to me a asked several Drs. if the Cipro had anything to do with this 1st Flare. They all have said there is no connection. Wow, thanks SO MUCH for posting about this. Last time I had a sinus infection, I was too sick to make the trek to my regular provider, and went to the office a mile away. She wanted to give me Cipro. I took it once about 10 years ago and got really sick. Based on that, I said I wanted Zithromax instead, but more than the Z-pak (I usually need a few days more). I took that and got better as usual. Now reading this post and I doubly glad I didn’t take the Cipro. I had no idea about this problem!! If I have seen my regular provider she probably would have known (she seems to know everything about my complex health issues), but this random dr, even with my records, made no mention of it. Thanks for bringing this up. Doctors need to be disclosing full information to their patients – its not acceptable or fair to withhold information because a patient ‘might’ imagine or exaggerate side effects. The FDA needs to get full information out there! WOW…This issue is current and painfully relevant for me. Which is worse, the disease or the medications? I took Levaquin recently for a respiratory infection, to prevent the virus from turning into pneumonia with my weakened immune system. Here we go again…RA meds on hold. Two weeks later I had searing pain in my left shoulder that felt nothing like RA pain. “Oh, you are just flaring, let’s switch to Enbrel instead of Humira.” said Rheum doc. I could not, and still cannot lift my left arm. “No…you do not need pain pills,” said Rheum doc. Ortho surgeon declares that I have a torn rotator cuff AND now add a cellulitis infection to the mix several days after first Enbrel injection. Two months later, still no methotrexate, prednisone, or biologic due to infection. I cannot function in my job as a teacher or as a human being in general. I have to work to support my disease. I HATE RA! I hate it too Lisa. I hope your shoulder heals soon – will you need surgery? I think the really important point is that our doctors need to learn to listen to their patients. When you are experiencing a bad effect from a medication the worst thing ever is to be told your symptoms are in your head. Lots of meds have lots of side effects common and uncommon. Withholding information because the doctor thinks you might imagine you have a side effect exposes the patient to unreasonable risk. Because doctor knows best? What? Like I don’t have a brain? I want a partnership not a dictatorship. There really is no such thing as a benevolent dictator. Leslie, I agree of course. This is something that is well-known in the cancer community, although I’ve not seen it discussed much in rheumatology. We’ve focused so much trying to get rheumatology to acknowledge the actual symptoms of rheumatoid disease that patients experience – because patients are often suffering so much and want to be treated. However, side effects are an important issue for informed decisions too of course. Shared decision making is the buzz-word, and it’s not possible w/out the information. I developed an Achilles tendontis (along the back of my heel/ankle) after taking Avelox, which is in the same family as Cipro and levaquin, all quinolones. Quinolones are heavy duty antibiotics with more side effects and complications than some of the other antibiotics.I now say I am allergic to them. As Kelly so well details, they are relatively contraindicated for people with RA, especially if you take steroids like prednisone. I actually just discussed this with my rheumatologist yesterday. She said they should be avoided, by people with RA….although sometimes there is no good alternative and you have to weigh risk-benefits. I agree with your rheumatologist completely. We will never forget telling the rheumatologist that the pharmacists had said it was “contraindicated” and he said it’s not and there would be no reason for it. I was put on Levaquin after several days on two other antibiotics failed to treat an infection with a high fever that put me in the hospital. My internist did inform me that there was the possible side effect of a tendon tear. Fortunately, I had no side effects from Levaquin and it was effective in treating what I was eventually diagnosed with atypical pneumonia. As with any drug, the risks and benefits have to be weighed and considered in the context of one’s situation. Cipro is what started my RA battle. I have always had some issues, that may or may not have already been RA. If I already had RA, it was very minor. Within 24 hours of taking my first dose of Cipro, I had full blown severe RA. Since taking the ONE pill of Cipro, I have had 5 years of RA Flare. It’s been one thing after another and my life will never be the same. Before taking Cipro I had extensive energy, and just worked through pain when it happened. Now, energy is something I hope for, and pain is something I just accepted. I warn everyone I know not to take these meds because the risk is not worth it. There are plenty of other meds that work that do not cause these problems. If these meds were causing a disease that was well known and understood, they would not be allowed to continue. I hope that in the future these dangerous medications will be removed from our health care system. OMG! I was out on Cipro a little over a year ago for some reason. After my second dose, I noticed my lower leg tendon felt like it was going to SNAP! So scary. I KNEW it was this antibiotic and quit taking it. Cipro is a strong antibiotic that may be great to treat certain things, but be careful! It can cause more damage than good!!! I have had RA since 2009. I know I have taken Cipro and IV antibiotic for kidney infections. I don’t know if the Cipro caused my severe achilles tendinitis but I have had it for several years. It is painful to walk and I have gained 40 lbs since I got it. The only remissions I have had were from steroid packs. After taking the steroids I crash hard and get sick with various things like bronchitis, costcochondritis, pleurisy, or kidney infections, and even the flu twice this fall. I have also had several root canals and I feel like there is a connection with the steroids causing the dental problems. I feel like I am getting off track here, but I’ll just say that this disease is so complicated it’s hard to tell what is causing what anymore. Reading this aggrivates me as to why the heck is it that my Rheumy gives me cipro everytime I have a sinus infection! Waynette, Why in the world did they give you Cipro for a sinus infection? It angers me that these doctors will prescribe whatever for no reason! They should have given you amoxicillin or something mild for a sinus infection!! I hope you are not experiencing bad side effects from it!! I have been treating a chronic infection in sinus and chest. In the last three months I have taken cipro, Avalox, zpack, and levaquin as well as trying to tolerate doxycycline. All of these of course have interrupted my RA tx. I cannot walk from my car into the grocery store without my leg muscles getting so fatigued that they don’t want to work and working on my hair fatigues my arms, I have to take breaks. I have been weak and get dizzy and feel like I’m going to pass out when I stand up. I do have something undiagnosed going on in my chest but I couldn’t explain why I didn’t feel like I was going to live. I am on day 10 of levaquin now and have a rx for another week. Drs are trying to knock out what is wrong with my chest without knowing for sure what they are trying to knock out. I wonder how long it would take me to feel halfway normal if I take no more antibiotics? I do remember about the time I got RA 10 years ago, I took levaquin and did have a ruptured acheles tendon. I did not know at the time that is what caused it. It happened for no reason. I believe I will go off antibiotics until someone can tell me why I am taking them. I have had a cough and chest pain along with thick sputum for several weeks but if its not better by now, it’s probably not going to get better with antibiotics. Don’t you agree? I am convinced that my RA was brought on by Levaquin, and possibly Avelox. Have a history of chronic sinus infections & the only drug that helped was Avelox. For some reason my ENT prescribed Levaquin instead of my normal Avelox during one of my sinus infections. Within a day I noticed very strange symptoms, mainly severe pain in both of my pinky fingers and a horrible burning pain in my Achilles’ tendons. I have a history of spraining my right ankle so I am used to pain in my foot. However this pain in the back of my foot was something I had never experienced until Levaquin. Part of the reason I am convinced my RA was brought on by Levaquin is because of what happened during a meeting. A coworker was complaining about her pinky fingers hurting and it immediately caught my attention. I knew she was battling a sinus infection as well and I asked if the doctor had prescribed her any medications. She said yes Levaquin. We discussed other symptoms we were having and they were identical. Unfortunately for me I had already finished the Levaquin prescription, and I was still having issues with my body. The next day I was having dinner with a friend and I was telling her the story about my Achilles tendon pain & my painful pinkies when her mouth dropped open and her face went pale. She suffers from autoimmune hepatitis which she swears was brought on by taking Levaquin. I knew she had taken that drug but I had not put one and one together and realized that I too was severely suffering from taking Levaquin. I could see the fear on her face that she was afraid of more severe side effects coming my way. Last year my sister suffered a stroke and she was admitted to the hospital. While she was there she had an upper respiratory infection. The doctor prescribed Levaquin. As soon as I heard this I demanded they give her a different antibiotic because of the severe side effects I experienced. The nurse pulled me aside and said she completely understood. She said there are many safer antibiotics and she does not like giving her patients those types of drugs. Having someone in the medical profession verify my fears was so incredible. Sadly, not a single doctor will ever discuss with me the severe side effects I had from Levaquin or my theory that my RA was brought on by Levaquin. But I am 100% convinced. I am aware of possible tendon damage/pain due to the fluoroquinolone antibiotics, but have you seen or heard any reports of tendon damage/pain due to Doxycycline? Over a year ago I had a severe and sudden onset of tendon pain/swelling/heat and am still unable to walk. Rheumatologist diagnosed as Reactive Arthritis but no cause was confirmed. I had been taking Doxycycline for a month prior to this onset. I then was prescribed high dose prednisone at the same time I was taking the Doxy and everything got much, much worse. I can’t find any literature about it but wondered if you had heard any experiences with the Doxy. I will add a word or two. The problem IS that NOTHING is done to protect anyone until several hundred thousand people die or are severely maimed by drugs that are never tested to the extent necessary to keep the public safe. We are supposed to accept so-called side-effects without question…as that is the nature of pharmaceutical drugs. Brainwashed. My mom died because of using FQ’s and steroids and NSAIDS together. Her doctor said she had age-related dementia. The pharmacist who KNEW the drugs had a black box warning, especially for people over 60 years of age, did not even warn us there was danger. I now know that I can NEVER take anything for granted when it comes to pharmaceutical drugs. I now research everything to the hilt. I avoid using pharmaceutical drugs if at all possible now. I do not trust them whatsoever. I do not trust doctors nor pharmacists now. My son was ill back in 2009 and hospitalized. He was given an IV of Lecaquin over a three day stay and a prescription for Levaquin. He started having shooting pains in his feet that moved up his calf. He was told that was just because he’d been ill and was week. My daughter who had cancer when she would be admitted with a fever was given Levaquin. She started becoming weaker. Losing balance stumbling n falling. She lost her battle to Hodgkin’s lymphoma in 2008. My mom in her 80s always having bladder infections was given Levaquin each time she became weaker and weaker. Now I was DIAGNOSED with Rheumatoid arthritis before Christmas but I’m sure I’ve had it for years. I’ve had a respiratory issue and sinus issue that Amoxicillan had not cleared up. My sister said I needed Levaquin or Cipro. I only remembered the Levaquin and forgot I’d heard bad about the Cipro. Anyways I started the Cipro on Wednesday and by Friday I felt weaker and now it’s a Monday morning and I feel worse than I did before. Why on earth are these drugs still on the market? I feel like I’ve been hit by a bus. Coughing even more than I had been and hurt so bad all over. Take these drugs OFF THE MARKET? I must tell you all that my pharmacist informed me that Plaquenil (common lupus and RA med) is also in the same quinolone class as these terrible antibiotics so please beware! Two years ago I was put on cipro for three weeks and had a reaction two months later. Serious tendon weakness in my neck and shoulders. They won’t stay in the sockets. My neck feels like a bobble head. Very painful and disabling. I was put on Plaquenil for RA recently and just found out about its relation to Cipro! Praying I don’t end up with further tendon issues due to the two weeks I’ve been on it. Stopped it today as soon as I was informed! I had to have a neck fusion due to Cipro. It has a double black box warning which means it should not be used unless all other meds have been tried due to the seriousness of the complications which exist. I have joint issues related to my Crohn’s disease but have had additional issues since taking cipro. Not my first time taking it but last spring developed tendon issues in my knee that keep reappearing. Difficulty walking and bending my legs. Nothing helps the pain. It does not remind me of my other joint issues–quite different and also involves my knees being weak. I fortunately called the pharmacist after a few days of symptoms and they said it was likely the cipro, stop taking it immediately. Didn’t need cipro just needed something weaker but unfortunately we are at the mercy of what we are prescribed. Was taking corticosteroids and a biologic at the time this occurred. I am now being sent to a rheumatologist but no one has checked for tendon damage. Kind thoughts to everyone…hope you get some relief and that physicians start prescribing wisely. I hope you have gotten relief too, Sarah. Last week, I heard the FDA has strengthened the boxed warning for this class of meds. So hopefully, it will be prescribed more cautiously, and patients will be believed. about a year ago, I had an UTI and was prescribed Cipro. Then, after 5 days I had a syncope while at work. It was my first and last one. After 6 months, I was diagnosed with RA as the patient cited above. Has anybody else experienced the same thing or just me and the patient above? I have heard this from only a handful of people, Ligia.